Nadia is Head of the Tax, Trusts and Estates team and is the Compliance Officer for Finance and Administration (COFA). Other responsibilties include HR and Nadia's role as the Senior Regulating Officer of the Law Society’s Wills and Inheritance Quality Scheme. 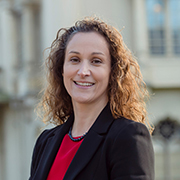 Nadia joined Griffith Smith in 1996 and specialises in Wills, Trusts, Inheritance Tax planning, powers of attorney and probate. She is also cross-affiliated to the firm’s Contentious Trust and Probate team, drawing on her considerable private client experience and qualification as a member of the Association of Contentious Trust and Probate Specialists. She is top ranked by Chambers HNW legal directory and also ranked in the Legal 500 where she is described as “empathetic and develops strong rapport” with clients.